Welcome to the Corvair V8 web site, maintained by the International Corvair V8 Registry, which is Chapter 006 of the Corvair Society of America (CORSA). We are dedicated to Corvairs with alternative power sources, often referred to as "Water Pumpers". 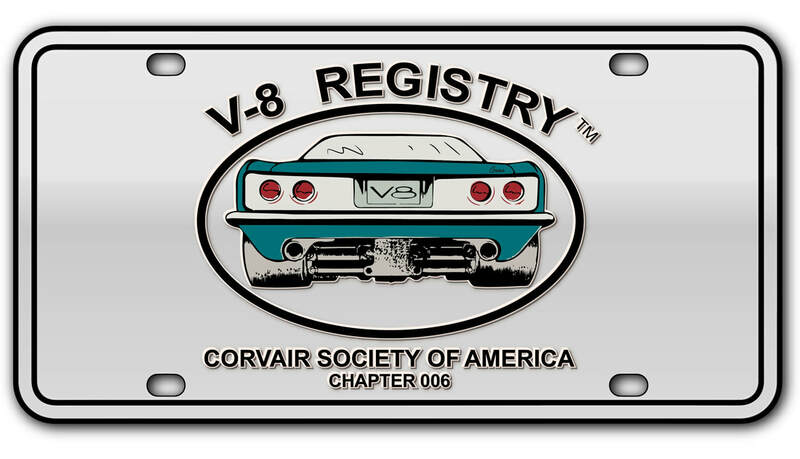 The V-8 Registry was formed for the purpose of bringing together those innovative members of the Corvair hobby who have a need for speed beyond the capabilities of the original car. Hobbyists have the opportunity to share their talents in design, fabrication and creativity with other members and with the general public. Members can interact with other members of the group for help with common car issues and to promote camaraderie. One of the main goals of the Registry is to foster continuing interest in the Corvair and to promote its unique capabilities to the next generation of enthusiasts. Promotion and exposure of our hobby will involve the use of a forum style web site and an awards competition for design and appearance at each International CORSA Convention. "WATER PUMPERS" include Corvairs with V-8, V-6 or other engines located in the rear, middle or front of the body. These conversions utilize either early or late model CORVAIR bodies in coupe, convertible, truck or van body styles. It is here we will share photos and data of the unique and innovative ways our favorite little compact car has been modified to the personal tastes of its owners.